Golden Palace has purchased another item on an eBay auction for the publicity (I think this might be the most expensive one so far too with the closing bid at $75,100). 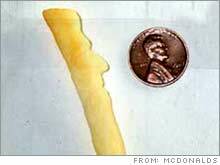 It's a McDonald's french fry that is in the shape of Abe Lincoln. What's more interesting is that it's not real (it's a plastic prop they used in a commercial). It was a pretty funny commercial that featured a couple who made the impossible discovery of the french fry while eating at McDonalds and then decided to sell it on eBay. The proceeds from the real auction are going to go to the Ronald McDonald charity foundation. Yeah this is really LAME! haha. those are so dumb. those people really waste their money, but if thats what they like, then more power to them!